Yesterday's Racers - Historic Motor Racing Cars. A website that concentrates on historic motor racing. From old Formula 1 cars to pre-war Bugattis and Bentleys. If it's old and still races, then it'll be here! Whatever race meetings or appearances I can get to, then I will post a report right here. Scrutineering bay at Summit Point Raceway - May 2000. Sunbeam Rapier starting off on the Monte Carlo Challenge from Brooklands Museum - January 2001. Please bookmark this page and then click on Gary's lid to enter the main site. Midget racer at the Crystal Palace Sprint, London - May 2000. 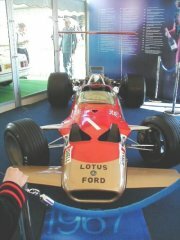 Lotus 49B at the Goodwood festival of speed, UK - July 2002. McLaren M8F in Montreal, Canada - June 2002. Tyrrell P34 test session at Donington Park - January 1999. Cooper 500 at the Larz Anderson bike meet in Brookline Massachusetts - October 2001. Lotus 58 at the historic test day Silverstone, UK - March 2001. Please bookmark this page before you enter the main site. Hosting & consultancy: TV Science Ltd. Last update of this page: 16th Janurary 2014.